The exhibition shows the replica of the Chambre des Cauchemars of the Abbey of Thelema, Sicily. 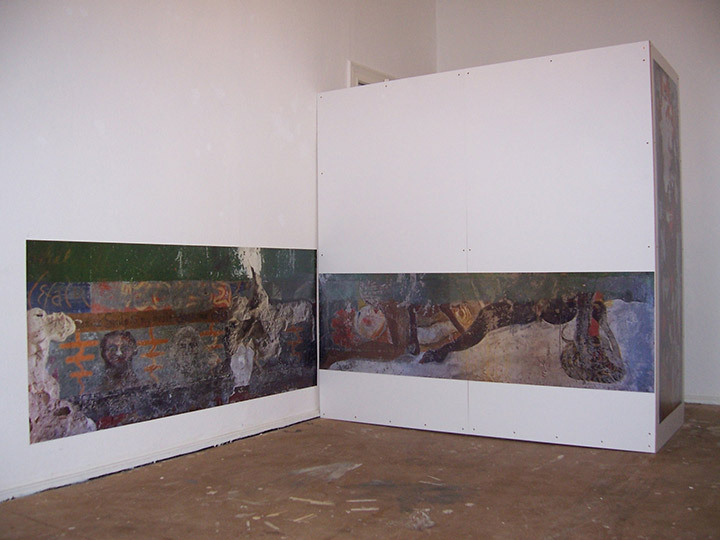 It documents the remains of Aleister Crowley's murals in 2010, which – in their original state of 1920 - must have covered the entire room. Today, the abbey is a ruin, the murals are in a desolate condition. Few fragments still exist. The remnants are located in the Chambre des Cauchmars, once serving as a chamber for rites of initation as well as Crowley's bedroom. Whitewashed and wallpapered by later proprietors, parts of the murals were uncovered by subsequent visitors. A professional restauration was never executed. The walls are defaced and covered with graffiti, the remains are seriously damaged due to the building's decay and climatic conditions. A restauration or reconstruction appears unpromising. The installation shows the actual state of the fragments, which can be attributed to Aleister Crowley. Scale and spatial disposition approximate the original. A central piece of the exhibition is the photograph of a double-headed, oogamous figure, which possibly refers to Baphomet, the idol of the Templars. The original painting decorates the door jamb and therefore can be viewed from a distance of approximately 80 cm only. In the photograph, which has been pieced together from several takes, Crowley's mural can be seen in one glance and from a distance for the first time.